With my semi-new found love for blue and white pieces, I knew these cobalt Cadence salad plates would be the perfect pattern to layer in a variety of place settings. 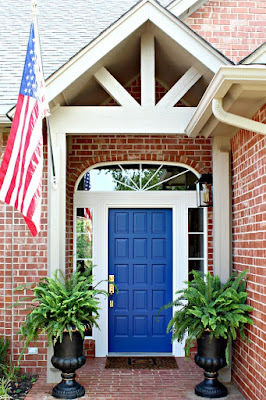 I think the modern lines of the criss-cross pattern mixes nicely with more traditional pieces. 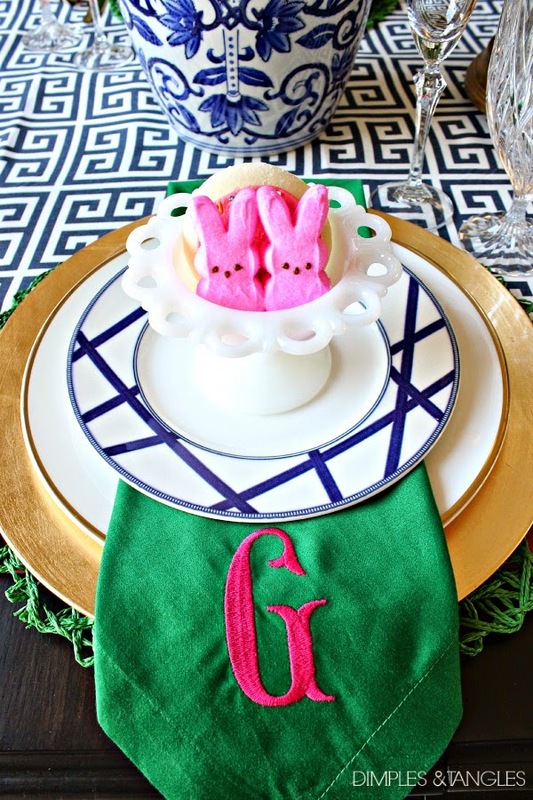 I also knew I wanted to add some fun monogrammed napkins. When I saw these green napkins at Homegoods a while back, there's no way I could leave them there. I've been using my *embroidery sewing machine more and more all the time. It's one of the best birthday gifts my husband's ever given me... I think it's paid for itself with all of the money I've saved on monogramming (not that I had many things monogrammed before, but now I can monogram 'til my heart's content!). 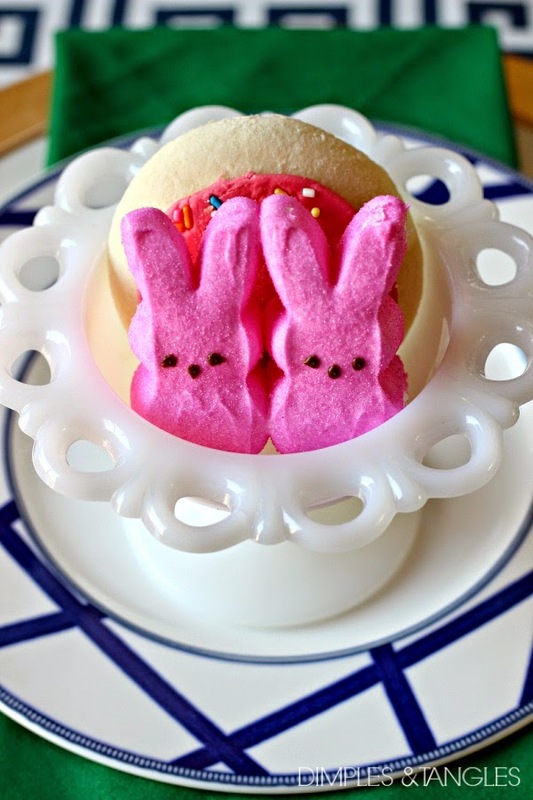 Store bought sugar cookies and pink Peep bunnies add some color (and a treat) to each place setting. Boy, do my kids love those cookies (and I admit, I do too). It was torture trying not to eat the props, but I resisted! I think lots of layers make tables much prettier and more interesting. I began with a few strips of fabric (I've become an expert fabric folder for table runners! ), and built up the place settings with a placemat as well as a charger to add some bulk and texture. These lovely Serenity Gold flutes are so fancy! Even though they look great in photos, I was pleasantly surprised at how they are even prettier in real life. They complement the Mikasa Arctic Lights crystal that I've had for years nicely. Even though we don't do alcoholic drinks, everyone will feel extra fancy drinking their sparking cider from these beauties! You can find Mikasa on Facebook or Pinterest for more beautiful ideas and table inspiration. They would love for you to visit their page and share what you think! 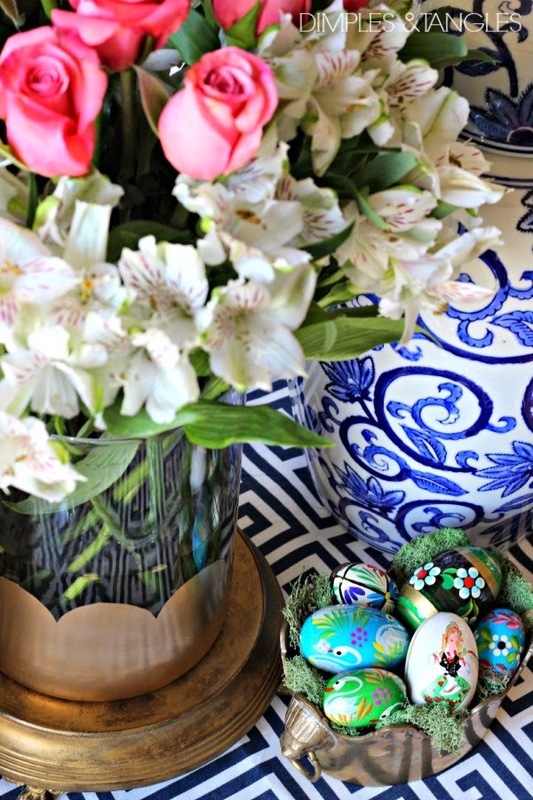 And, I'd love to hear your thoughts on the Mikasa dinnerware, the table, or your plans for Easter! Especially for you, the kind folks at Mikasa are giving away some of their gorgeous pieces to one Dimples and Tangles reader! Use the Rafflecopter below to enter to win both 4 Cadence salad plates and 4 Serenity flute glasses. Everyone gets an automatic entry, just click the drop arrow beside "Invent Your Own Option" and leave your email address in the box. Additional options are available for bonus entries! Giveaway will close Saturday at midnight (12 am CST). *Many thanks to Mikasa for sending the Cadence plates and Serenity flutes to me! Thanks for being supportive of the companies that partner with Dimples and Tangles. 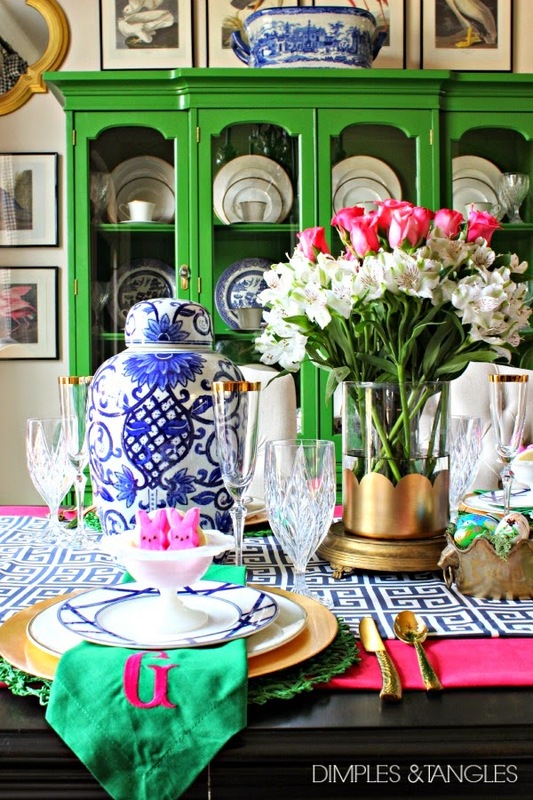 I love your colorful tablescapes. Just beautiful! That blue is so gorgeous. 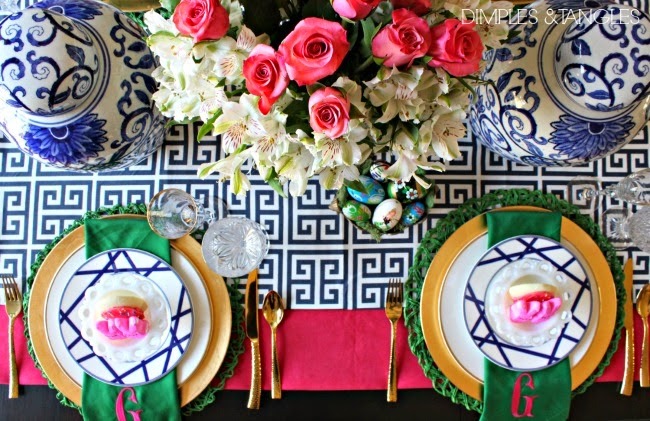 I always love your pretty tablescapes! You have to share the details of that monogram, it looks so good! ok well i think you know i love those salad plates!!! 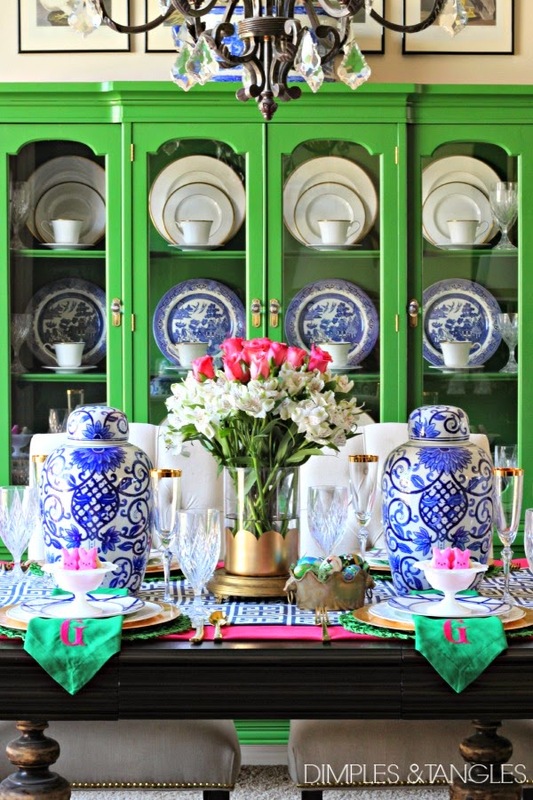 the whole table is stunning- you are such a master at color!!!! i love it! Beautiful and cheerful as always Jennifer! Those napkins - wow!! Love! Your table is gorgeous. 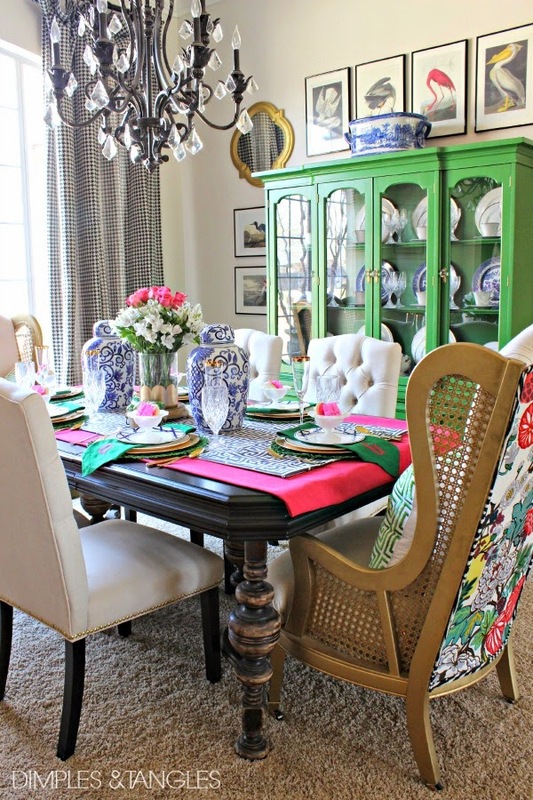 I love how you have layered your fabrics and mixed patterns. Stunning. 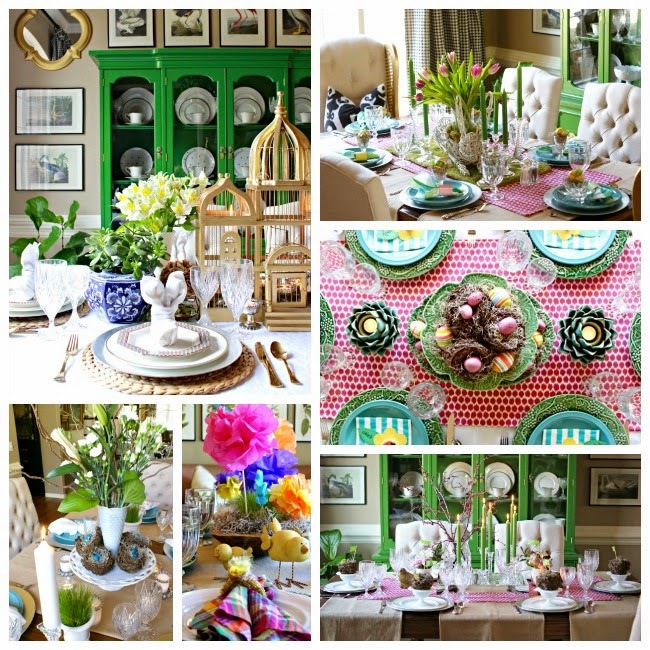 Jennifer your Easter table is beautiful! As usual I love how you mixed the patterns of the linens and settings. The Mikasa salad plates are so cool, I adore that criss cross pattern, and you did an amazing job putting it all together! Thank you Marigene, I hope you have a blessed Easter as well! 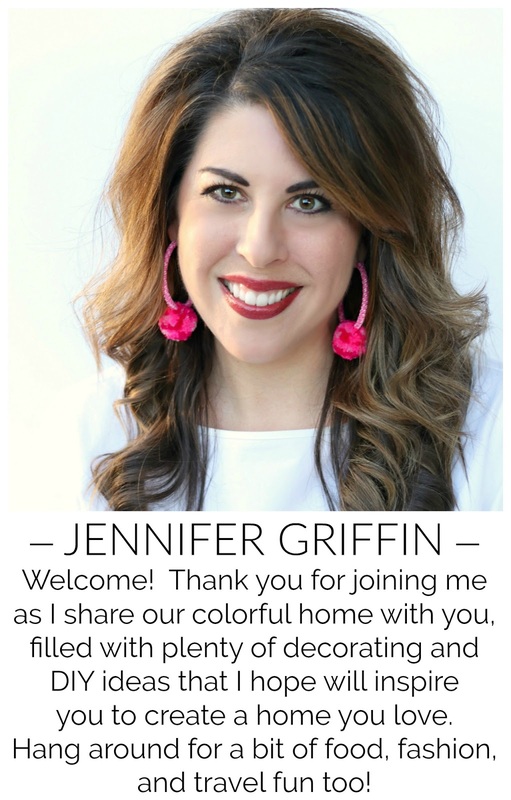 Love all the color you use Jennifer! What a beautiful tablescape! I am going to have to check out that sewing machine. I am in the market for one and I can never get enough monograms! How do you like your embroidery machine? I've been looking at getting one but am afraid to pull the trigger. I'm nervous it'll be too difficult to use and therefore a waste of money! It's official. You need to plan celebrity weddings? work at the White House? ha- amazing as usual! Those plates are so gorgeous! Love those plates! Now I need to order the embroidery machine!! I love the layers and the mix of traditional with modern touches. So cheery and evokes a sense of Spring! I think it is your best tablescape to date!! I am a Methodist minister's wife and have a degree in interior design. It is obvious that you have great fun with this! Thanks for the giveaway. A beautiful table makes the food taste better, i think! 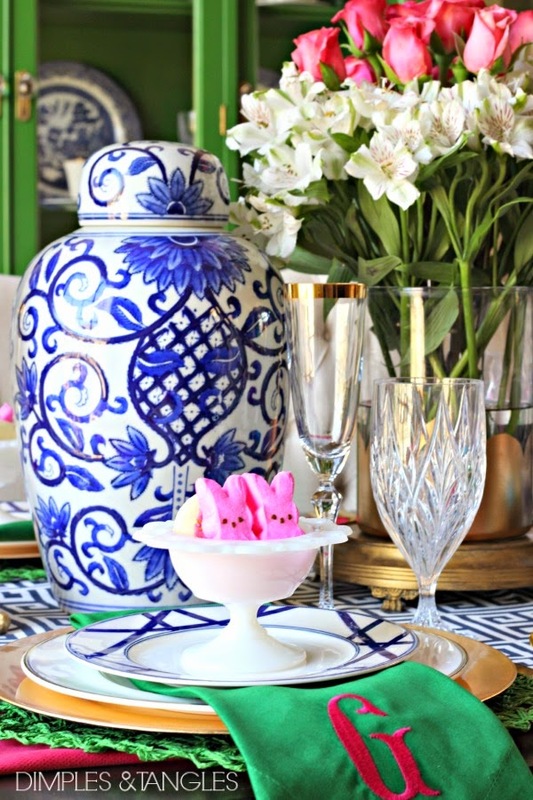 The glassware and blue and white dishes make such a fresh spring table. You have an amazing gift for mixing colors and patterns. It always refreshing to see what you have created. 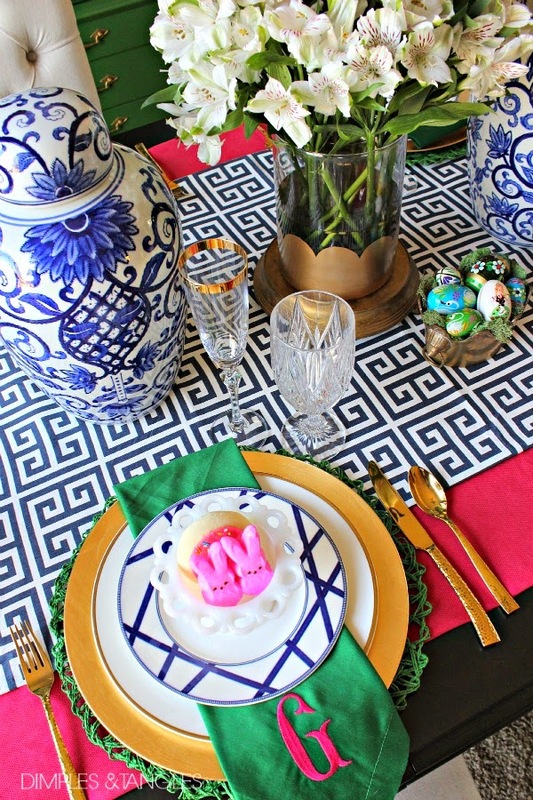 Another gorgeous tablescape, Jennifer! You have me tempted to find some gold flatware. So did you eat the cookies as soon as the photo shoot was over? I would have! Stunning! 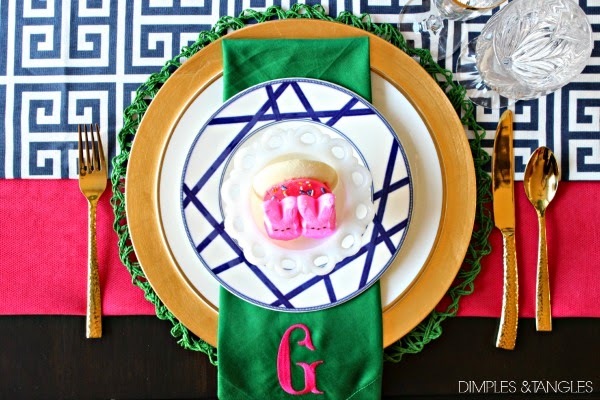 I love everything about this table and place settings Jennifer! 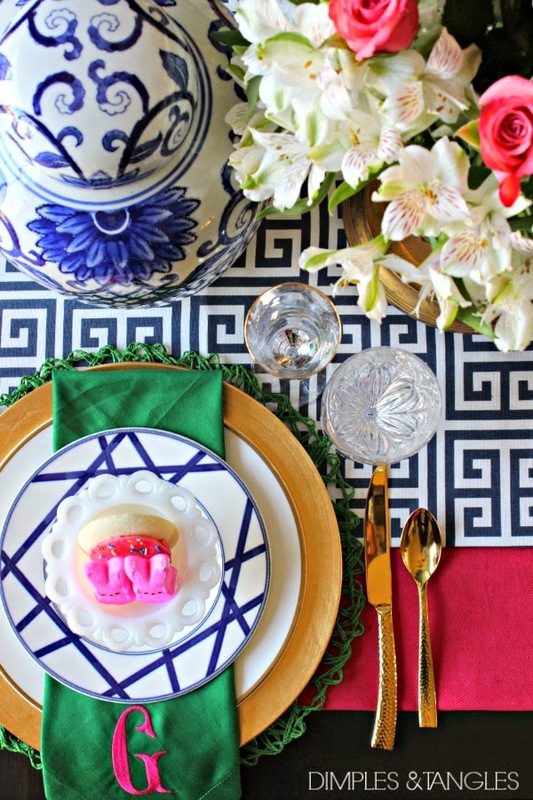 Love the pattern you chose, and of course your table is GORGEOUS! I love the blue and white table runner! Where did you find the material? Love it! What monogram software do you use? I have the same machine and I love it, but I don't think I have that font. Looks beautiful! Hi Laura. I actually buy fonts from Etsy and download them. I really like this shop and they are so reasonable. This font is Fish Tail, and I bought the one with 3 sizes, 1, 2, and 3 inch. The G on the napkins is 3". Thanks Kathy! I bought it on fabric.com, but they also have it at Hobby Lobby if you have one near you. It's on the folded bolts with the printed duck fabric. It's called Premier Prints Towers if you want to order online. You are the queen of gorgeous tables!!! Gah, so beautiful!